There is still time to sign up! Members Len Atlas and Florin Baldridge have mapped out a beautiful drive through the Rogue River Valley, and an optional Jet Boat river adventure with dinner from Hellgate Excursions. We will begin the day with a drive through a very scenic part of the Rogue Valley covering about 120 miles. We begin at about 10:30 AM on Saturday June 16th in the parking lot of the Redwood Hyperion Suites in Grants Pass. We’ll meet back at the hotel around 3:00 PM in time for the Jet Boat excursion, just next door to the hotel. 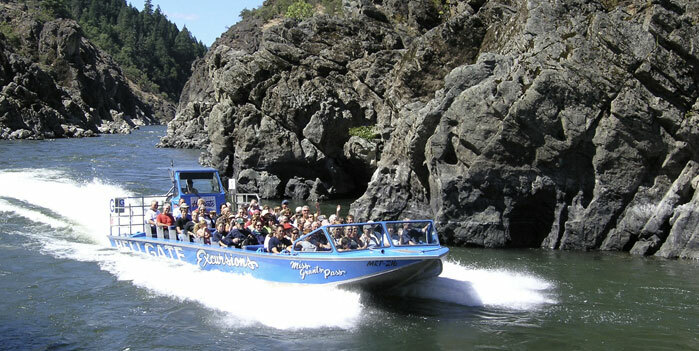 The jet boat excursion is $70.00 per person, includes dinner and a $2 service fee. All tickets for the jet boat excursion are totally refundable if canceled 48 hours in advance of June 16. The event hotel is the Redwood Hyperion Suites in Grant’s Pass. Setup your own reservation by visiting www.redwoodmotel.com or call 888-535-8824. If you’d like to attend either the driving tour, or the jet boat excursion, or both, click on the registration button below to be taken through the registration process on msreg. If you have any questions please contact Bruce Feller (contact information available at the registration link below).